After our binge last year, I've been trying not to spend money on the house this winter. But this month we've been looking around our main floor and we had a few glaringly modern items we really wanted to replace with more traditional style options. 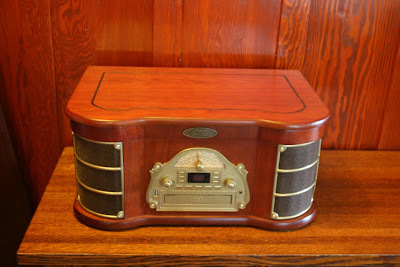 The first to arrive was this Pyle music player. I looked far and wide for a player in wood that could handle iPods; this was the only one I found. It's a little larger than I wanted because it also has a record player (though we don't own a single record), but it was the best value I found. 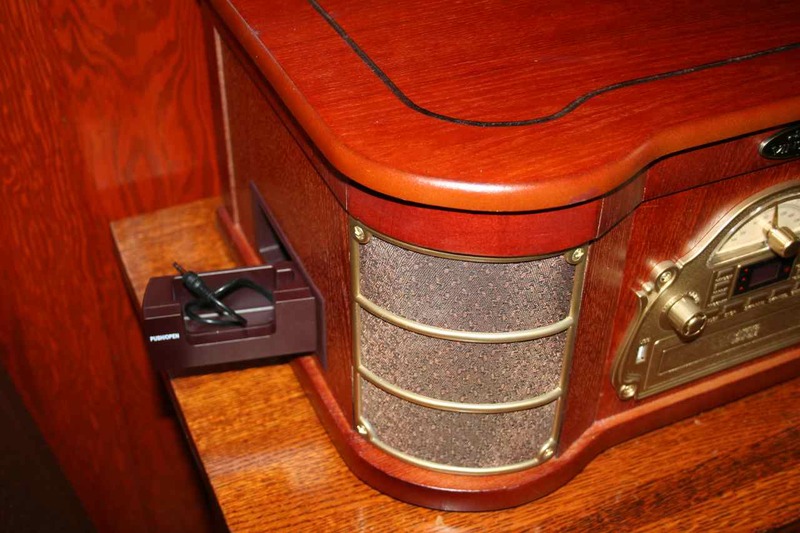 The iPod plugs in over on the side. 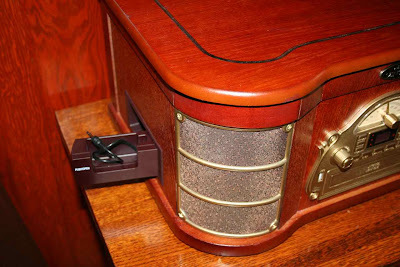 The main drawback of this player over the Apple Hi-Fi system is it doesn't charge the iPod so you can only listen so long, and then you need to go find a place to plug in and charge your iPod. This is what the old system looked like, so I think it's a bit of an improvement. 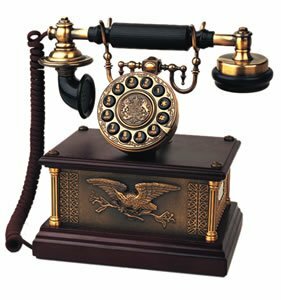 I also bought this neat phone based on a 1911 design. But I have now detected a slight oversight in our remodel planning—phone jacks. We use remote phones, so phone jacks just weren't part of the planning. In fact, this house used to have quite a few phone jacks, but they were those big, ugly plastic boxes tacked onto the wall, so all of them, but one in the den, were removed during the remodel. Oops. I think we need to put a phone jack back in just for this phone. 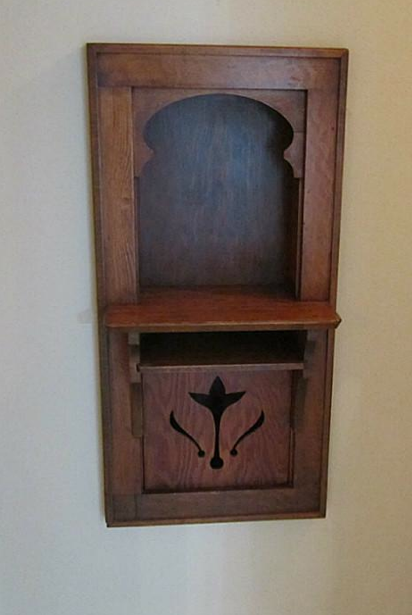 Hmm, wouldn't it be fun to put in an old fashioned phone nook . . . like this one. Maybe someday. 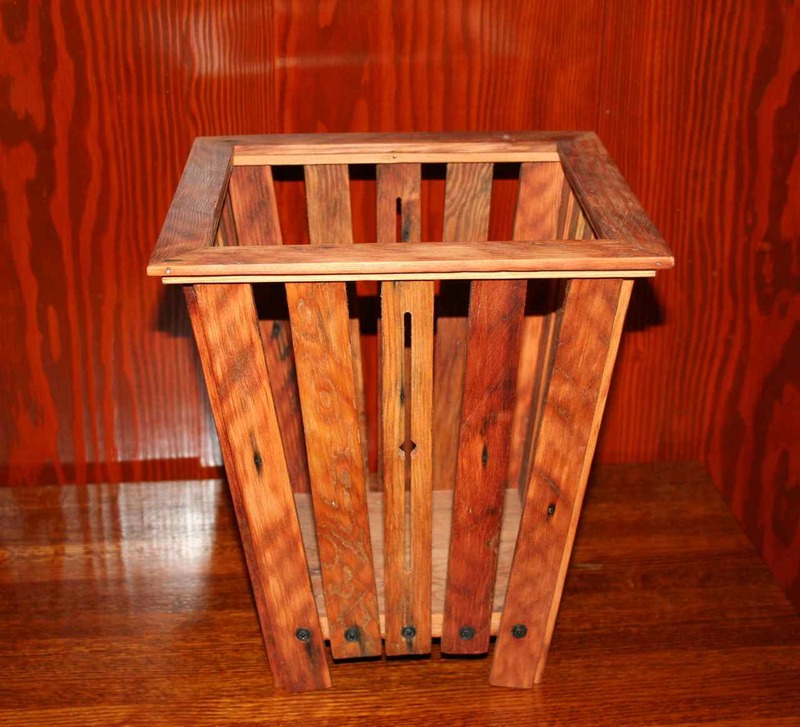 I also found a neat wastebasket made from recycled lath boards. 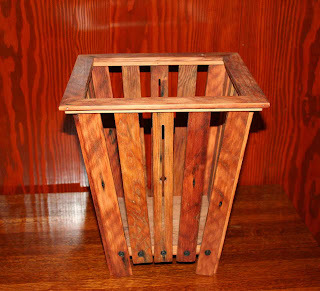 Compared to many of the other handmade wastebaskets I've seen, this was a bargain ($10 + shipping). I bought it from a local person, so I've written to see if they've got more. Now I'm trying to decide what to do for a liner; perhaps a washable fabric sleeve that fits inside. 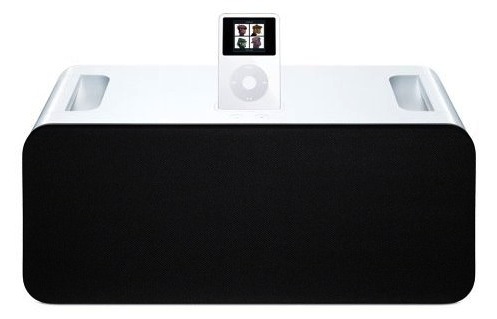 Sadly, I have a modern iHome that isn't compatible with my iPod and won't charge it, either. I don't really understand why that would be the case, but it is. Sad. I feel your pain. I was very ticked off when the new iPods were not compatible with the old iHomes and that's why we stopped upgrading our iPods. But, alas, they are dying one-by-one and we'll be forced soon to upgrade them all.